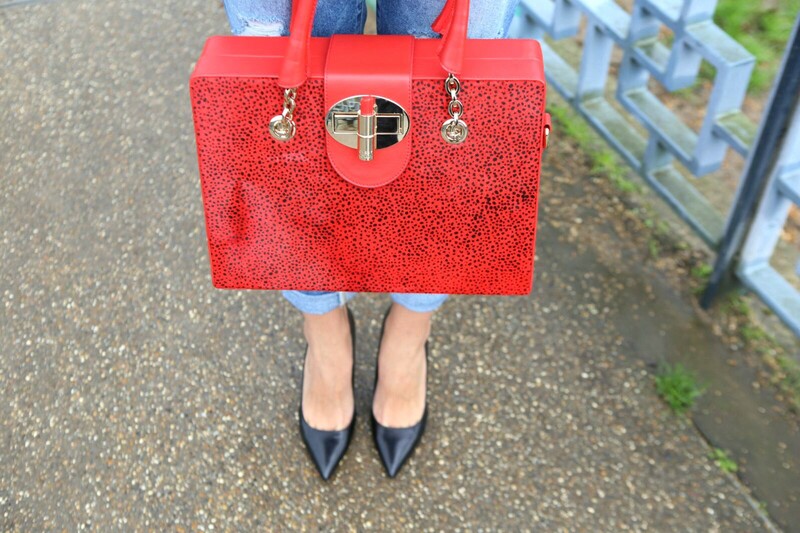 This week I decided to go for a casual look matching my new amazing Oysby handbag! As you have probably noticed, red is one of my favorite colors. I love wearing it especially in the winter, as it brightens up the grey weather! What I love about this handbag is that it is quite unique and different from everything else you could find on the market! It is made of high quality, smooth Red Napa leather, combined with leopard printed hair at the front. 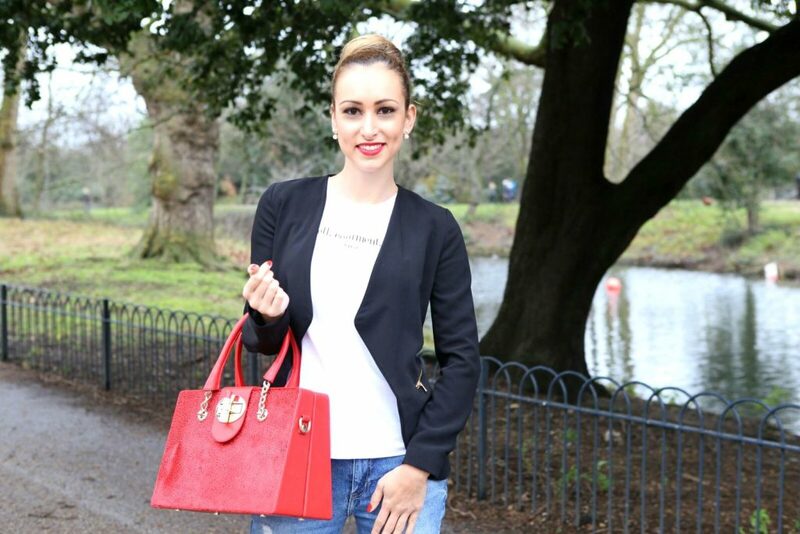 The handbag also has signature OYSBY lipstick clasp closure, which is sooo cute & classy! For those of you who haven’t heard of it, Oysby is a London avant-garde luxury footwear and handbag brand that manufactures genuine leather products with eclectic designs and imaginative craftsmanship! To make a contrast between the red and the jeans, I wore white t-shirt with a playful print and a classic black blazer. That combination makes the outfit perfect for a Sunday walk in the city or a nice brunch. 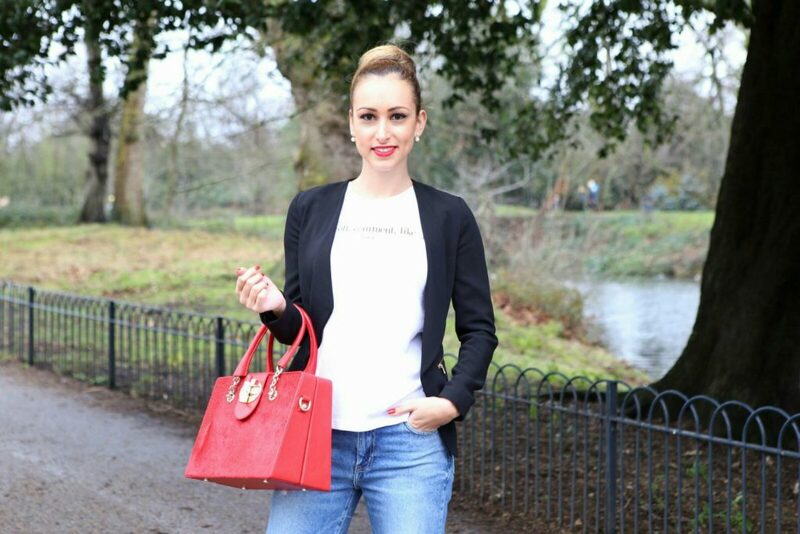 The ripped jeans and the t-shirt keep the look very casual, while the bag and blazer bring some elegance to it. To finish the look, I used pearl earrings and classic black heels, as they perfectly match the idea of casual/elegant look! Hope you like this week’s look! I am off to lunch in central now, have a nice Sunday everyone! You can find my handbag here! Previous Post Who Are the Best Dressed TV Characters? Next Post What to wear on Valentine’s Day?